‍Papua New Guinea, Australia, Japan, New Zealand and the United States intend to join together in a Papua New Guinea Electrification Partnership in support of Papua New Guinea’s objectives for electrification.This high level partnership forms part of the enduring economic and security partnership between [our countries]. This initiative will also be open to other partners that support principles and values which help maintain and promote a free, open, prosperous and rules based region. The Papua New Guinea Electrification Partnership is intended to focus on the importance of principles-based, sustainable infrastructure development that is transparent, non-discriminatory,environmentally responsible, promotes fair and open competition, upholds robust standards, meets the genuine needs of the people of Papua New Guinea and avoid unsustainable debt burdens. It is intended to adopt a strong focus on investments that provide employment and training opportunities for local contractors and communities. It is also intended to focus not only on delivering high impact investments but ensuring improved coordination and governance within the energy sector. 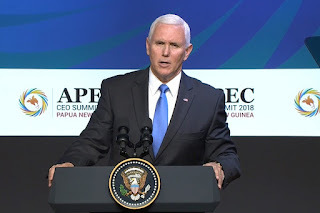 The Prime Ministers of Papua New Guinea (O’Neill),Australia (Morrison), Japan (Abe), New Zealand (Ardern), and the Vice President of the United States Mike Pence hereby sign this Joint Statement to mark the announcement of this new multi-country initiative at APEC House on 18 November 2018. The announcement signals a strong commitment from these countries to supporting growth enabling investment in key economic infrastructure in Papua New Guinea.